• Staggered fir tree branch design provides low insertion forces and high extraction forces. • Initial fir tree serves as a locating feature for assistance in blind assembly applications. • Disc feature provides anti-rattle protection in high vibration applications. • Staggered fir tree branch design provides low insertion forces and high extraction forces. • Initial fir tree serves as a locating feature for assistance in blind assembly applications. • Disc feature provides anti-rattle protection in high vibration applications. HellermannTyton's fir tree mounts provide a secure grip in a mounting hole and protect against dirt and other impurities. The mount can slide along the strap of the cable tie for proper orientation. The fir tree mounts are designed to provide a low insertion force and high extraction force. 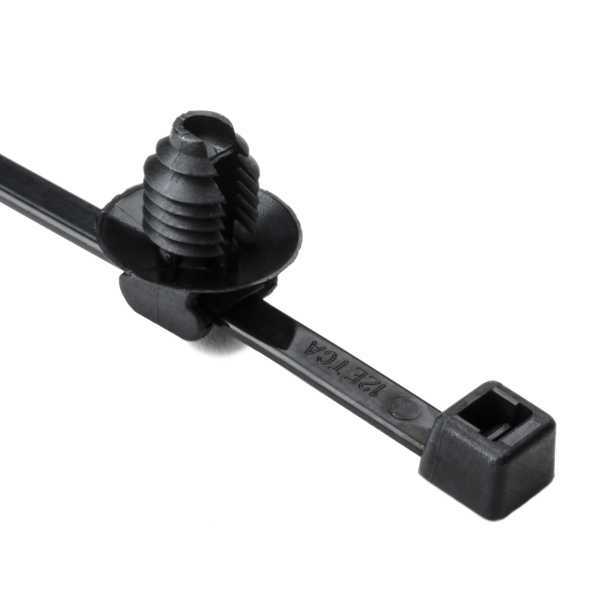 This mount is sold as an assembly with the cable tie.